Consists of a wooden case with an ebonite top. A wooden frame mounted on top contains eight copper bridges and frames, eight pairs of small black, plastic, cylindrical pots, each containing a resistance contact. White lettering on the front of the frame below every pair of pots, labels then 10, 20, 40, ... to 1280. Four pairs of brass, screw-top terminals are behind the frame, labelled G, P, C and B from left to right. A slidewire variable resistance, consisting of two wires, with a vernier scale is in front of the frame. The large scale of the slidewire resistance is silvered and engraved 0-30cm, with 1mm divisions and the vernier scale is labelled 0-10. The slidewire has a black, plastic slide, with a brass lock to keep the slide in position. No units are marked on any scales. 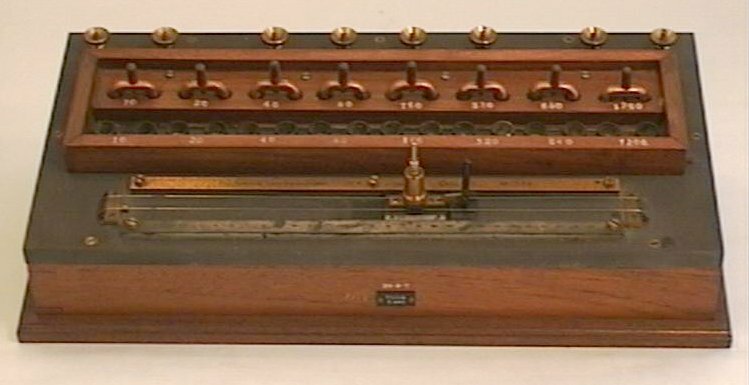 This instrument was used to measure the potential of a cell by comparing it to a standard cell, or to measure the potential difference between two cells, with reference to the standard. 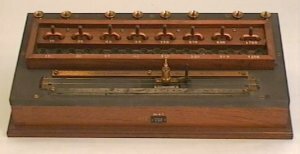 The potentiometer provides the variable resistance required for this and is used in conjunction with a galvanometer, to note when zero current flows and the variable resistance is correctly adjusted. The galvanometer is connected to the terminals labelled G and the standard cell across B. Cell to be compared is connected across those labelled P and if a second cell is also to be used, it is connected across C. The pots containing the contacts also contained mercury. To reduce the resistance, the copper bridges are moved from their positions in the frame and placed to connect a pair of contacts. These bridges and the mercury pool contacts from a low-resistance path for the current and short circuit the desired resistance (resistances in 0.1 ohms, although not labelled so, i.e. 1280 refers to 128.0 ohms), connected below and across the two contacts, inside the case. The slidewire variable resistance is available for fine adjustment of the resistance. Each slidewire has a total resistance of 1.5 ohms, hence the 0-30 cm scale can be converted to a 0-3 ohm scale, providing accuracy to two decimal places. When the galvanometer detects that there is no current flowing, i.e. the resistance has been correctly adjusted, the potentials of the cells may be calculated with reference to the standard cell, according to the division of the variable resistance. Some of the advantages to this method of determining potentials is that there is no need to measure the deflection of the galvanometer (require it to read zero), the vernier scale provides considerable accuracy and the measurements are taken with no current flowing through the cell, therefore there is no need to consider the effects of the internal resistance. Duncan, G. and Starling, S.G., Text-book of Physics, Macmillan and Co. Ltd., 1944, p.890,891.